It's 2018. Candidates don't need the establishment anymore. In spring 2016, a U.S. presidential candidate made the above prediction to Businessweek. That candidate was none other than Donald Trump, and he was speaking of the GOP. His words seem ludicrous, but Trump’s anti-corruption pose, populism and vaguely left-sounding economic rhetoric would ultimately take him all the way to the White House. Trump was also openly racist, misogynistic and unencumbered by facts. But he foregrounded economic decline and corruption—and the tight link between them—with a rhetorical force and consistency that always eluded his Democratic opponent, Hillary Clinton. In a campaign speech in a small Pennsylvania town in June 2016, Trump noted that Pittsburgh’s steel had built much of the nation. But “our workers’ loyalty was repaid with betrayal,” he said. “Our politicians have aggressively pursued a policy of globalization—moving our jobs, our wealth and our factories to Mexico and overseas. Globalization has made the financial elite who donate to politicians very wealthy. But it has left millions of our workers with nothing but poverty and heartache.” Political corruption, in other words, was the root of the nation’s economic stagnation. “I alone can fix it,” he famously thundered at the 2016 GOP Convention. Of course, Trump’s policies bear no relation to his rhetoric. He stocked his administration with members of the corporate elite who pursue tax breaks for the corporate elite. He put the Environmental Protection Agency and the Food and Drug Administration under the control of the industries they are tasked with regulating. Trump has, in short, infected our politics with new doses of corruption while posing as the antidote. Trump’s 2016 campaign against the rigging of our politics drew from a deep well of righteous fear and anger that neither major party was prepared to tap—because neither would rise to the moral challenge. Had it chosen to, the Democratic Party might have occupied the populist vacuum filled by Trump. But the party’s New Deal-era critique of concentrated wealth and power has been supplanted by a corporate-friendly worldview. Trump’s ironic and unintentional gift to American democracy may be that—by crashing through the traditional party battle lines, and saying what the major parties weren’t free to say—he has created a space in our politics in which the seeds of genuine reform, planted by actual reformers, have taken root and are beginning to grow. Victories by independent, anti-corporate Democrats in the November 2017 off-year elections demonstrated that the Democratic Party has the potential to again put forward a vision that inspires voters. But that slim hope depends on the creation of a progressive electoral infrastructure separate and independent from the party establishment, and thus relatively free of the influence that corporate donors wield over both parties. The 2018 elections will provide an early, formidable test of that new infrastructure’s power to upend the status quo. Exit polling from the 2016 election also hinted at deep anger and skepticism about the corrupt state of our politics. A Washington Post poll gave respondents four choices regarding “what quality of leaders matters most.” Clinton easily won in three of the categories—“cares about people like me,” “has good judgment” and “has the right experience.” But she lost to Trump by a devastating margin—82 percent to 14 percent—in the fourth category, “can bring needed change.” Unfortunately for Clinton, that was the quality that a plurality of voters, 39 percent, thought was most important in a president. Trump’s tenure in office has done little to soothe those concerns. In October 2017, Chapman University released its annual survey of Americans’ fears. The most common fear, by far, was “corruption of government officials,” cited by 74 percent of respondents. By contrast, only about half of respondents feared money troubles and high medical bills. Since the election of Trump, fear of government corruption has risen 13 points. For progressives, there is the bitter irony that the primary potential vehicle for reforming the system—the Democratic Party—is entrenched in and dependent on that system, and deeply suspect among not only progressives but the general public. 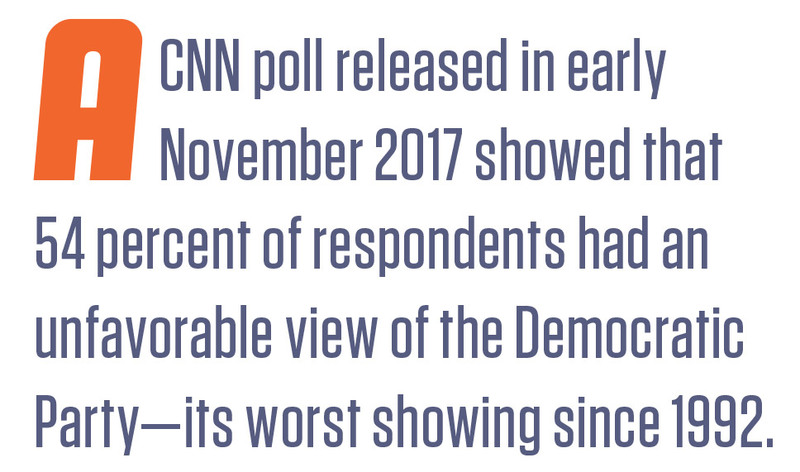 A CNN poll released in early November 2017 showed that 54 percent of respondents had an unfavorable view of the party—its worst showing since 1992. (Sixty-one percent had an unfavorable view of the GOP.) Only 36 percent of registered Democrats said they were extremely or very enthusiastic about voting in 2018, one point lower than the level of enthusiasm expressed by registered Republicans. Recent revelations about the party’s tilting of the presidential primary in Hillary Clinton’s favor, in particular, have produced waves of spectacle and disgust. It’s often difficult to see how the party might pull itself together enough to win elections, much less pursue deep reform of American politics. But what if all the attention on the party establishment misses an important, bigger-picture development? 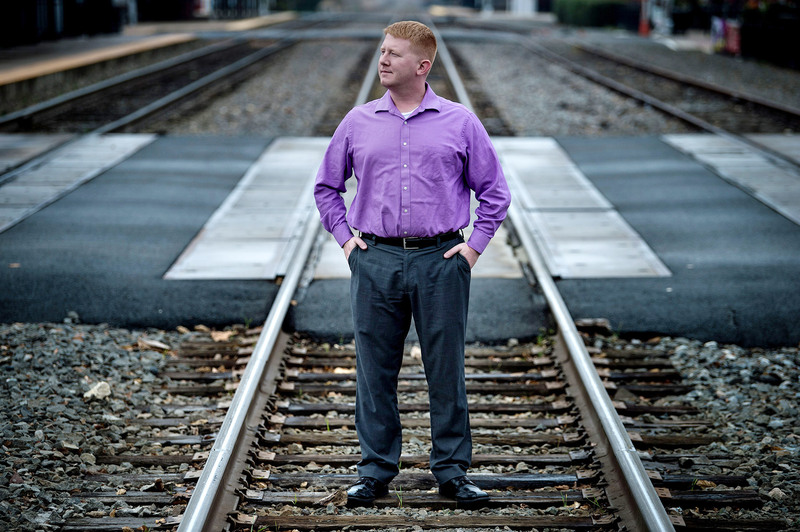 Carter’s story, and the off-year election in Virginia more broadly, points to the emergence of a new model and a new infrastructure for redefining the Democratic Party. The traditional model has been for progressives to try to “push the Democrats left” by focusing on certain issues—a higher minimum wage, for example, or single-payer healthcare—and using donations, volunteer efforts, organized protests, in-person and virtual lobbying campaigns, and votes as leverage over politicians and the party. That model remains powerful in the era of Trump. It’s the model used by Indivisible, for example, the largest of the core “resistance” groups that have emerged since Trump’s election. The Guardian recently reported that the loose network of locally led progressive groups consists of more than 6,000 registered chapters, six times the number associated with the right-wing Tea Party in its heyday. But the election of Carter and other left insurgents reflect a new model: an infrastructure that’s capable of recruiting, grooming and supporting candidates already committed to a strong progressive platform and who, though they often run as Democrats, have only marginal allegiance to or need for the Democratic Party. In other words, it’s about running progressive candidates and offering them a network of independent support, rather than pushing the party establishment left. Our Revolution (OR) and the Working Families Party (WFP) are two of the most active organizations devoted to running progressives for political office. OR was founded in August 2016 and emerged from Bernie Sanders’ presidential bid. WFP was founded in 1998 but has intensified and expanded its work substantially in the past two years. At a basic level, their endorsement is a seal of approval that candidates can use in campaign materials. On a case-by-case basis, the groups also offer digital trainings, help with fundraising drives, media work, volunteer mobilization and campaign management. OR endorsed about 59 candidates in the November 2017 elections, of which 26 won. WFP endorsed a total of about 1,000 candidates in 2017. Of those, it identified about 300 as especially strong progressives and devoted significant resources to their campaigns. More than 200 of these “progressive heroes” won. 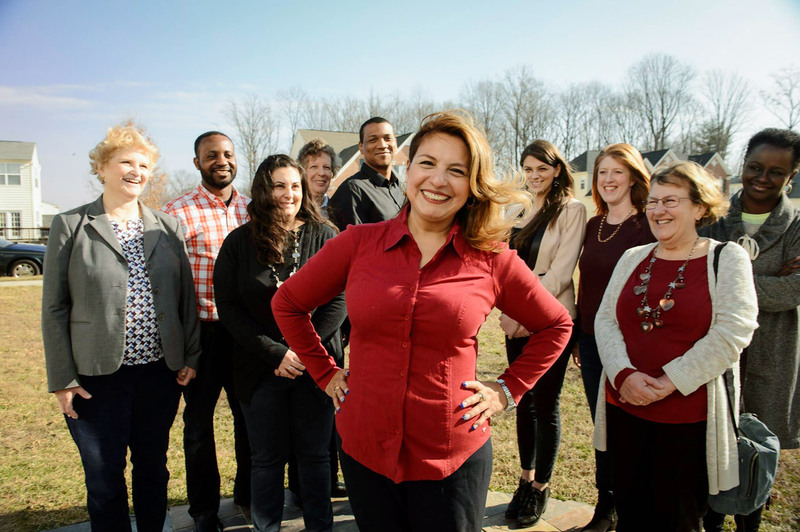 In the Virginia House of Delegate elections, both groups endorsed Carter, and both endorsed Elizabeth Guzman, a Latina who won her race. WFP was particularly involved in the campaigns of Guzman and another winner, Hala Ayala, also Latina. Staff and volunteers knocked on more than 20,000 doors on their behalf. These efforts helped make Virginia the biggest and most hopeful surprise of the 2017 elections. Going into the election, the GOP controlled the state’s House of Delegates with a strong majority, 66-34. Democrats flipped at least 15 seats, leaving Republicans with a bare majority—though contests were marked by voting irregularities, and Democrats were still contesting the results as of late November 2017. Upset wins by Carter, Guzman, Ayala and others were crucial to the the party’s success. But the progressive groups that made the surprise victories possible have a tense relationship with the Democratic Party establishment. They aren’t pushing the party left in the normal sense. Instead, they’re simultaneously operating inside of it, by working to take over the leadership of state chapters (in OR’s case), and acting as an outside gravitational force, pulling the party in a progressive direction by helping win long-shot races where the Democrats would normally struggle or not field a candidate at all. Building an electoral infrastructure powerful enough to reshape the Democratic Party, much less challenge the corruption in U.S. politics, is in the early stages. But the work is hardly limited to OR and WFP. People’s Action, a network of progressive and community organizing groups, has recently begun offering support and trainings for political candidates. As of November 2017, 70 of its members planned to run for office at all levels in 2018. People’s Action is particularly focused on increasing the progressive cohorts in 14 statehouses. Brand New Congress (BNC) and Justice Democrats (JD), both founded in the past two years and devoted to federal races, have recruited and are training and supporting dozens of candidates for the House and Senate. Like the other organizations that make up this infrastructure, JD and BNC are intentional about cultivating a diverse slate. One of JD’s endorsed candidates, Fayrouz Saad of Michigan, would be the first Muslim woman elected to Congress. Another, Brianna Westbrook of Arizona, would be the first transgender woman. JD and BNC are distinguished from the other groups by their exclusive focus on Congress. They envision their work in terms of building a unified bloc of progressive votes that will transform the institution in a relatively short timeframe. Both will likely endorse between 30 and 50 candidates in the 2018 cycle (many of them cross-endorsed). 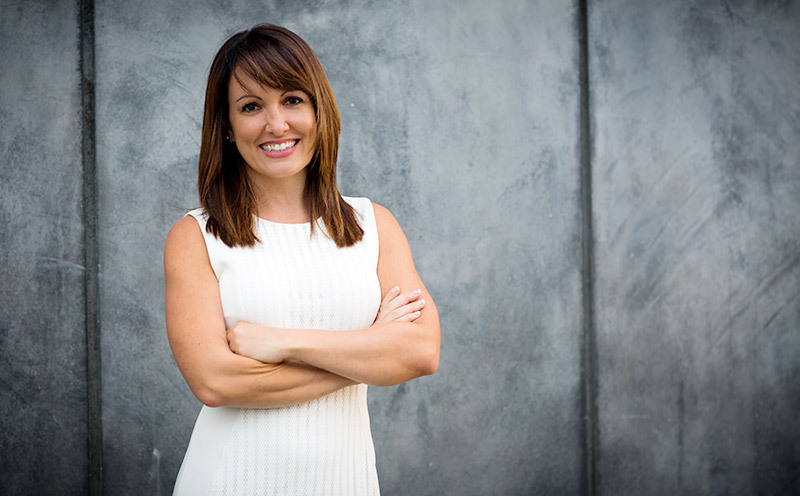 In November 2017, Justice Democrats announced its endorsement of Alison Hartson as a challenger to Sen. Dianne Feinstein in the California Democratic primary in June. Before entering the race, Hartson was the director of a PAC devoted to passing a constitutional amendment banning corporate money in elections. Five states have passed a resolution endorsing the amendment so far. Hartson is making corruption the centerpiece of her platform, which calls for full public financing of elections. Not all candidates endorsed by these groups foreground corruption so explicitly. 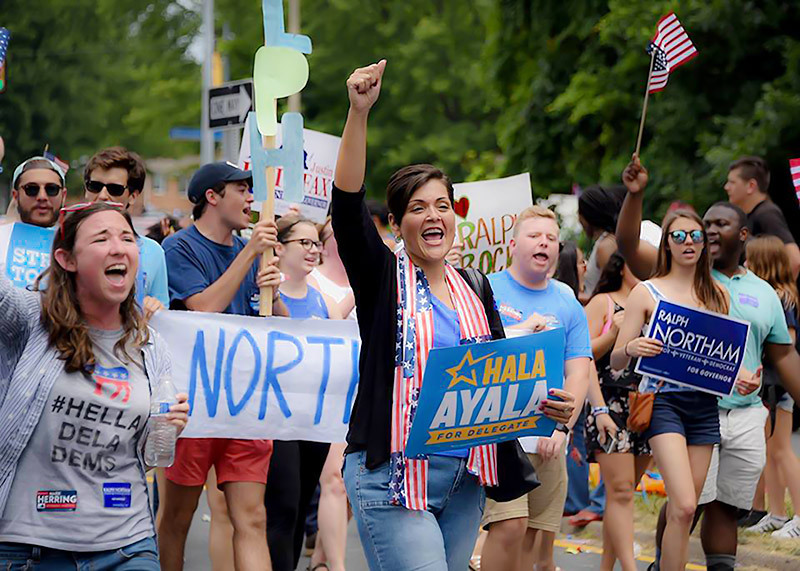 In the recent Virginia election, for example, Guzman and Ayala talked more about economic justice, healthcare and women’s rights than corruption. But all of the organizations that make up this emerging electoral infrastructure define themselves in opposition to the corporate influence within the Democratic establishment and push for fundamental reform of the campaign finance system. Offering candidates the nuts-and-bolts support they need to run as Democrats—but independent of the party—is key to that mission, since it reduces or eliminates their reliance on donations from corporate interests and lets them focus on bringing in small donations from a broad base of supporters. 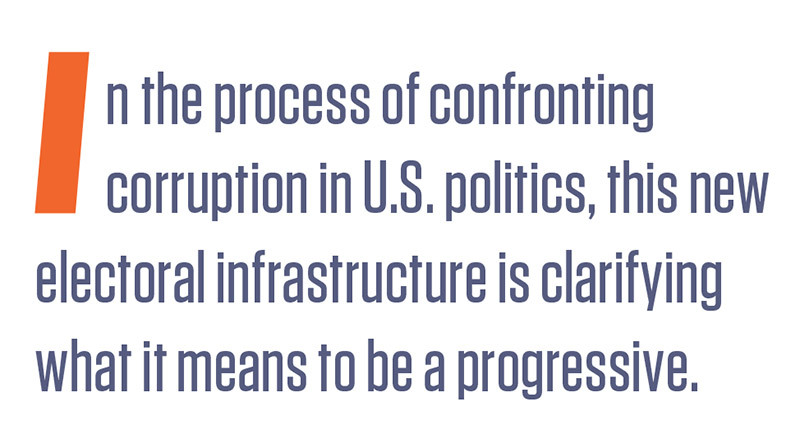 In the process of confronting corruption in U.S. politics, this new electoral infrastructure is clarifying what it means to be a progressive. OR, BNC and JD restrict the candidates they endorse from accepting corporate PAC donations. They do allow donations from union and other non-corporate PACs, based on a vetting process. The first item in the JD platform is a ban on private donations to politicians and the creation of a “clean public financing system … to end the takeover of our government by corporations and billionaires.” The group concedes, however, that under the system we have, getting elected requires money from private donors. In other words, to have any hope of reforming that system, you have to play by the rules of the game. Support for some or all of those positions is common among Democrats, of course, and the gap between establishment Democratic Party politicians and progressive demands has narrowed rapidly over the last two years, at least in theory. A majority of Democrats in the House are now co-sponsors of a Medicare-for-all bill, for example. Support for a $12 or $15 federal minimum wage is now common, as is support for some version of free college or trade school. It’s often been noted that the 2016 Democratic Party platform was the most progressive major party platform in U.S. history, one concrete legacy of Bernie Sanders’ presidential bid. The great fault line between establishment Democrats and the new electoral infrastructure comes down to corporate influence. It’s partly an issue of optics—it just looks bad that Democrats get so much money from corporate PACS. But it goes deeper. It’s also a question of passion, and the capital that Democrats are willing to invest in reforms, such as regulating big banks, that would benefit their constituents but are opposed by their donors. By making the corruption currently inherent in our politics a central issue—as Donald Trump did in 2016—the groups in the rising progressive electoral infrastructure acknowledge what everyone knows to be true but many Democratic politicians shy away from saying because they’re enmeshed in and dependent on that very system. The party’s progressive wing aims to point the way forward by showing that a political party that actually listens to and serves the people is still possible. For all his toxicity, Bannon is politically savvy. He knows that the populism he preaches has been used to powerful effect in our history—both the right-wing racism he peddles and his left-wing focus on the corrupting influence of corporations. And he understands very well that we’ve been at this crisis point before. 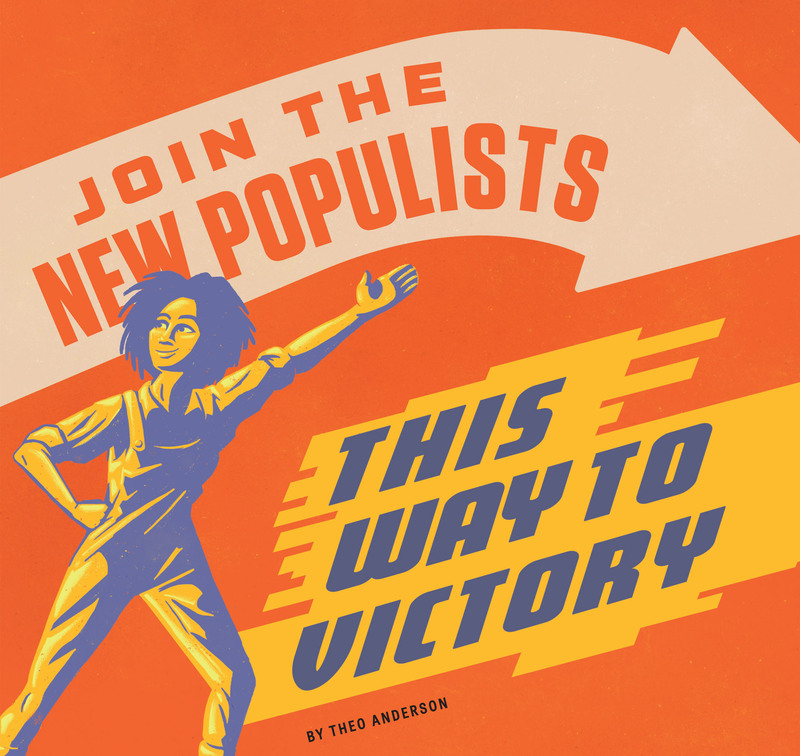 The People’s Party of the 1890s—the original Populists—rose up as a cross-racial alliance focused on the concentration of wealth and the rapidly rising power of corporate interests in the last third of the 19th century. The Democratic Party neutralized the People’s Party challenge through a program of race-baiting, intimidation and co-option of the Populists’ rhetoric and parts of their platform. But the Populists’ critique of inequality and corruption survived in the fledgling progressive movement of the 1900s and 1910s, and it found concise and powerful expression in the Progressive Party platform of 1912. 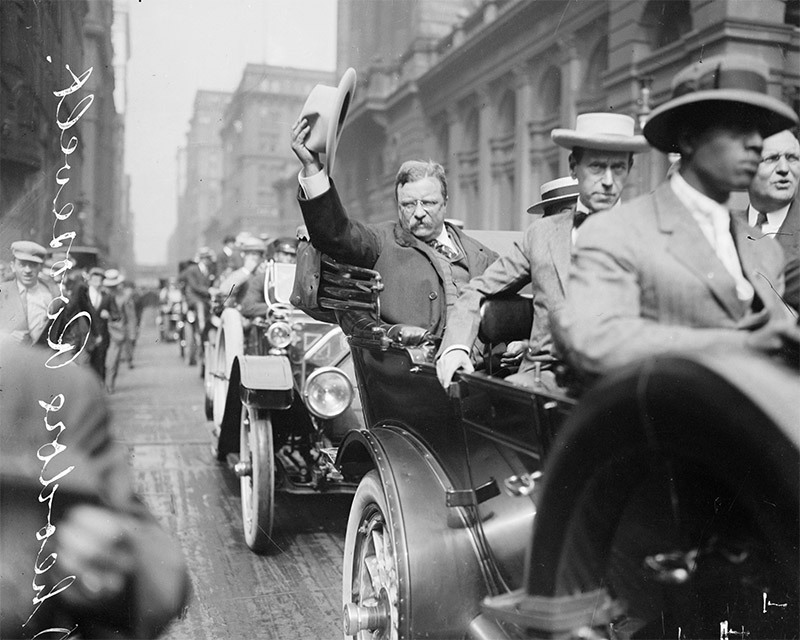 The Progressive Party’s nominee, Theodore Roosevelt, did better than any third-party candidate in U.S. history, gaining 27 percent of the vote. In 1912, nine Progressives were elected to the House, and the party also had a down-ballot presence. Though it lost the presidential election, the party made the corruption of the system a central issue in national politics, and its mobilization for the election lent momentum to the early progressive movement, which was building the infrastructure to push through reforms at the state level. New York, in particular, served as the testing ground for the workers’ rights and social insurance legislation that would become federal law in the New Deal. 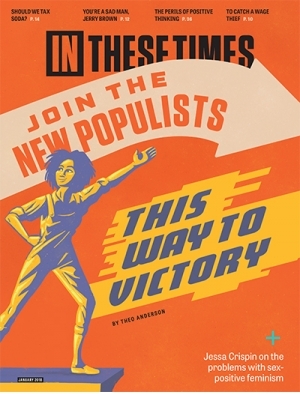 The overarching political story of the last four decades has been the assault by the Right, not just on specific New Deal achievements, but on its vision: the idea that high levels of public sphere investments, through a highly progressive tax structure, create a more stable and more just society—with more opportunities for everyone. A central theme of that story has been the rising influence of corporate money in politics, and how it has been used to overwhelm and dismantle that New Deal vision. So, as Bannon rightly noted, this is “a very big historical moment.” The great question facing us is not so much whether progressives can push Democrats left. It’s whether traditional methods of political influence and progressives’ emerging electoral infrastructure—operating essentially as a third party within a party—can pull the rest of the Democrats into the movement’s orbit. One uncertain aspect of our current crisis is the fate of the Democratic Party. In the Democrats’ better days, the left-wing populism that created the Progressive movement was also the party’s heart and soul. Without that soul, Democrats’ policy platforms ring hollow. Fundamentally, what’s on the line is whether the unelected corporate “invisible government” that has allegiance only to profit will reign unchallenged, and corporate interests will fully control the levers of government. The last time this story played out, it took nearly five decades and a crisis of capitalism—the Great Depression—for the early vision and agenda of the Populists and Progressives to find broad expression at the national level as the New Deal. We can’t know what will come of the seeds of reform being planted now, or how long they may take to bear fruit. Or if they ever will. All we know with certainty is that the story doesn’t end well if we fail. “The first task of the statesmanship of the day,” read the Progressive Party’s 1912 platform, “is to dissolve the unholy alliance between corrupt business and corrupt politics.” That remains our first task today. Theo Anderson has contributed to the magazine since 2010. He has a Ph.D. in modern U.S. history from Yale and writes on the intellectual and religious history of conservatism and progressivism in the United States.